Science Box: Fungi, do you eat me or I eat you? Fungi, do you eat me or I eat you? I've always loved science communication and few years ago I started doing some small things about it. 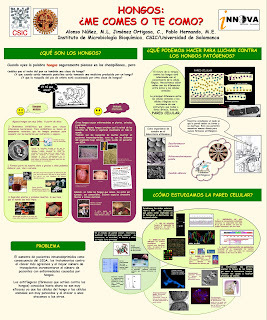 Here you have the poster I presented to the first contest of science communication posters of the Spanish Young Researchers Association (Valencia, 2005). I did it with my friends and colleagues Cristina Jimenez Ortigosa and Eva Pablo Hernando. I hope you like it even if it's in Spanish.. we won the third prize!!! !